After a season filled with underwhelming and overpraised biopics, we’ve finally struck gold: the new Martin Luther King Jr. film Selma is a note perfect historical drama. It deftly sidesteps the Important Historical Figure movie cliches to create an inspiring piece of filmmaking that’s filled with rich authenticity and detail. Ava DuVernay has directed other smaller independent films in the past but here, she proves that she is even more effective with a larger budget, a sound script and an ensemble cast of incredibly gifted actors and actresses. Her talent is undeniable and I hope this movie leads DuVernay to other avenues of success in the future. Instead of trying to condense King’s entire life into one film, Duvernay smartly chooses to focus on the six month period from Martin Luther King Jr. (played by David Oyelowo) receiving the Nobel Peace Prize to the 1965 civil rights marches from Selma to Montgomery. We start in 1964, after the passage of the Civil Rights Act that banned segregation in the South. After seeing the systematic discrimination that remained in tact, King comes to President Lyndon Johnson (Tom Wilkinson) with a plan to push his Movement forward, specifically by protecting voting rights for African-Americans. When Johnson deems the move politically unfavorably, King takes to the street and leads a trio of peaceful protests in Alabama that would capture the nation’s attention. There’s something so incredibly human about Selma and it starts with the compassionate and commanding lead performance by Oyelowo as King. He effectively strikes a remarkable balance between the fiery vigor of King’s public persona and the quiet humility behind King’s personal life. There’s nothing showy about this performance: Oyelowo chooses wisely not to do an imitation of one of the 20th century’s most memorable historical figures but instead, he captures his essence with a level of intimacy that I could not have expected. 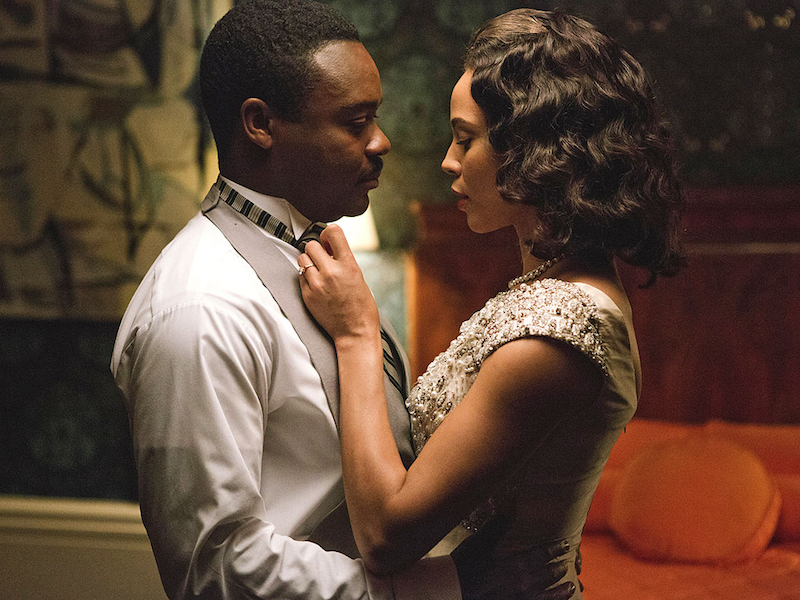 Selma also has a crisp and distinguished look to it without feeling too polished or overproduced. The accomplished cinematographer Bradford Young uses unconventional framing and unique camera angles to add a visual flair that doesn’t distract from the captivating true story that’s being told. The lighting is the film is also top notch: I was taken especially with the Selma prison scenes that find the perfect amount of moonlight to cast on the prisoners faces as they speak to each other in the night. In addition to the technical aspects, the writing is also consistently brilliant. Given that the filmmakers couldn’t reach an agreement with King’s estate to utilize the words from his speeches, the screenplay, written by Paul Webb and co-written by DuVernay, deserves even more credit for devising new passages of public speaking that use King’s cadence and rhythm without using the words that he actually spoke. The risk for failure is inherently high when capturing a historical figure on film, especially one as widely known and influential as Martin Luther King Jr., but Selma stands as a towering achievement of dignity and humanity.